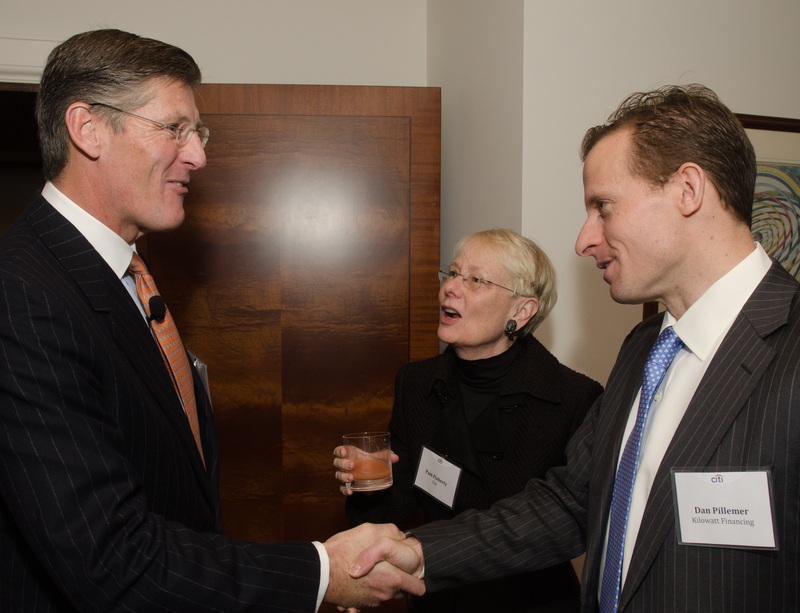 Citi CEO Michael Corbat, Kilowatt Financial Chairman and CEO Dan Pillemer and Pam Flaherty, Citi Foundation (retired) at a recent event celebrating the launch of Citi’s new efforts to drive sustainable growth. 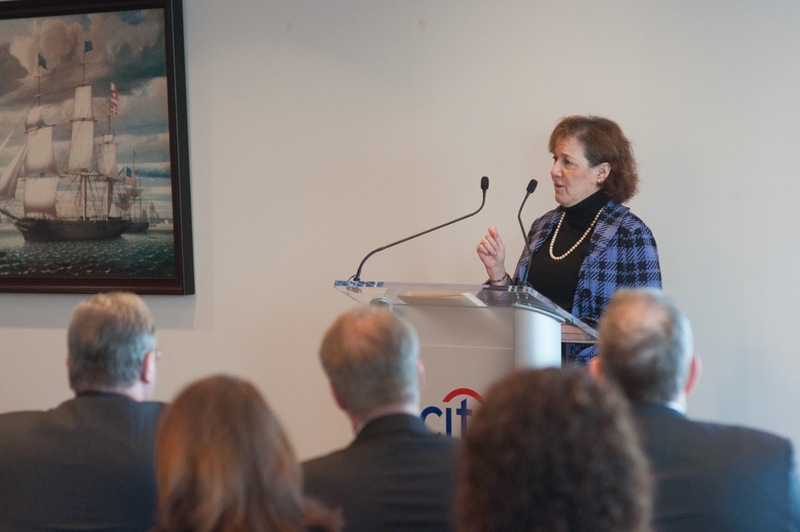 Ceres President Mindy Lubber addresses NGOs, investors and business partners at Citi event in New York City. NEW YORK – On Wednesday, Citi announced a landmark commitment to lend, invest and facilitate a total of $100 billion within the next 10 years to finance activities that reduce the impacts of climate change and create environmental solutions that benefit people and communities. Citi’s previous $50 billion goal was announced in 2007 and was met three years early in 2013. With this $100 billion initiative, Citi will build on its leadership in renewable energy and energy efficiency financing to engage with clients to identify opportunities to finance greenhouse gas (GHG) reductions and resource efficiency in other sectors, such as sustainable transportation. As part of a commitment to helping cities thrive during this period of unprecedented urban transformation, Citi will seek to finance and support activities that enable communities to adapt to climate change impacts and directly finance infrastructure improvements that increase access to clean water and manage waste, while also supporting green, affordable housing for clients, including in low- and moderate-income communities. This environmental finance initiative is part of a new five-year sustainability commitment that also focuses on environmental and social risk management and sustainability goals for Citi’s own businesses and operations. Citi has established new environmental footprint goals for 2020, including 35 percent reduction in greenhouse gas (GHG) emissions, 30 percent reductions in energy and water use and 60 percent reduction in waste, all against a 2005 baseline. The initiative also includes a longer-term 2050 GHG emissions reduction goal of 80 percent, created using a climate science-based methodology. Targeting 33 percent of its real estate portfolio to be LEED certified, Citi will also seek LEED Platinum certification for its 388/390 Greenwich Street facility in New York City, which will become the company’s global headquarters once it is fully renovated. In 2013, the company met 2015 operational performance goals for GHG emissions and waste two years early, reducing emissions by 25 percent and waste to landfill by 41 percent, all from a 2005 baseline. Citi is on track to meet its 2015 goals of reducing water usage by 20 percent, and see its global real estate portfolio 20 percent more energy efficient, and 15 percent LEED certified. Environmental and social risk management remains a key priority and policy and standards will continually evolve in response to emerging risks and new product development. Citi was one of the founders and original signatories of the Equator Principles, which provide environmentally responsible guidelines for investing in the developing world.